Saving for retirement is important for everyone, but it’s especially important for women. Women tend to live longer than men, but they may not spend as many years in the workforce and they may not earn as much. Because of this, women tend to lag behind men when it comes to retirement savings. On average, a 65-year-old man can expect to live to be about 83, while a 65-year-old woman can expect to live to nearly 86, according to data from the Social Security Administration. That means a woman’s savings need to stretch that much further. But in a survey released in March 2017 by the Transamerica Center for Retirement Studies, women reported far lower retirement savings than men. The median savings for women was only $34,000, compared with $115,000 for men. The survey also found that the percentage of women who had no retirement savings was higher than the percentage for men. Women also tended to be less confident about their ability to retire in comfort, according to the survey of over 4,000 U.S. workers. Start saving for retirement, if you haven’t already. Make regular, consistent additions to your savings. Educate yourself about retirement savings and investments. 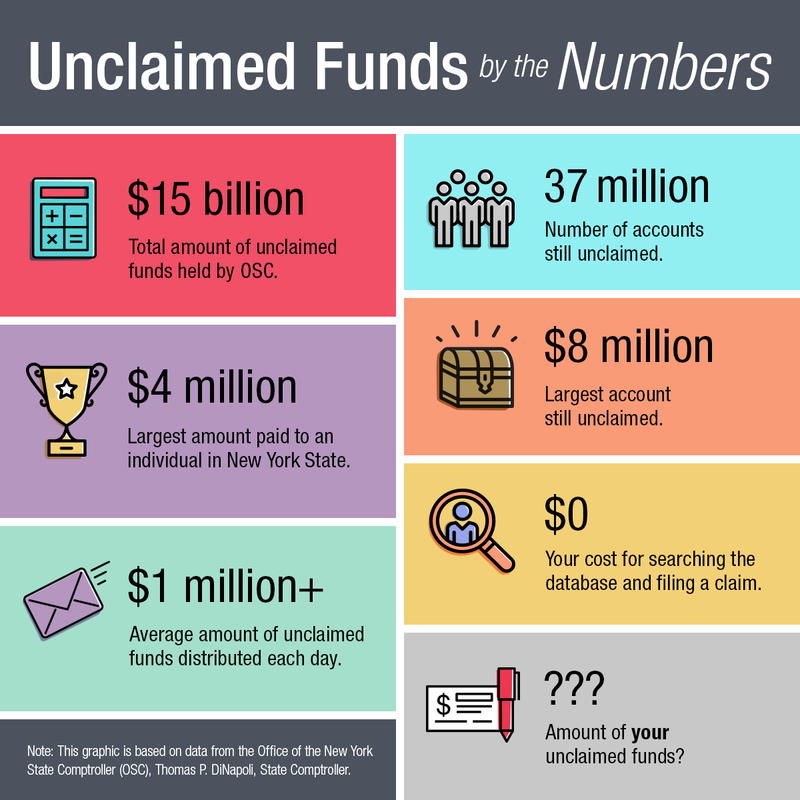 Learn more about your NYSLRS retirement benefits. There is a lot of good information in your Member Annual Statement. You may also wish to read the NYSLRS publication How Do I Prepare to Retire? Learn more about your Social Security. If you are close to retirement, make a retirement budget. Talk to a financial adviser. Make a retirement plan. Write it down. And revisit it periodically. A defined benefit plan, such as the NYSLRS retirement benefit, provides a monthly pension payment for life. But, savings are still important as a supplement to a pension and Social Security, a hedge against inflation and a resource in an emergency. Content last revised February 28, 2019. This entry was posted in General News, Members and tagged ERS, Information is the Key, members, New Members, New York State & Local Retirement System, NYSLRS, personal savings, PFRS, Preparing to Retire, retirement, Retirement Confidence, retirement planning, retirement readiness, Retirement Savings, Women and Retirement on June 21, 2017 by NYSLRS. 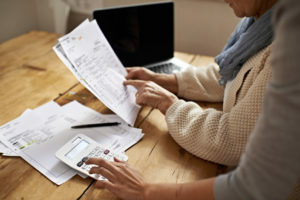 A new National Institute on Retirement Security (NIRS) report reveals that the median retirement account balance has dipped to $2,500 for working age American households, down from $3,000. 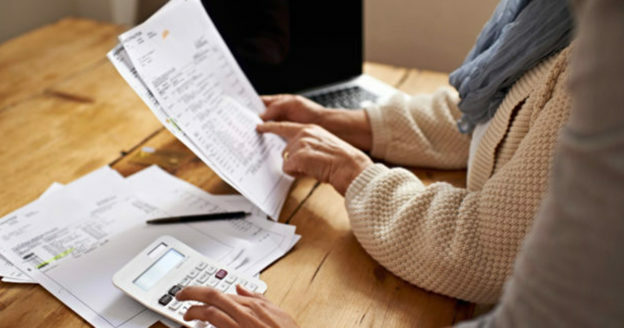 NIRS researchers discovered that some 62 percent of working households age 55–64 have retirement savings less than one times their annual income, which is far below what Americans need to be self-sufficient in retirement. 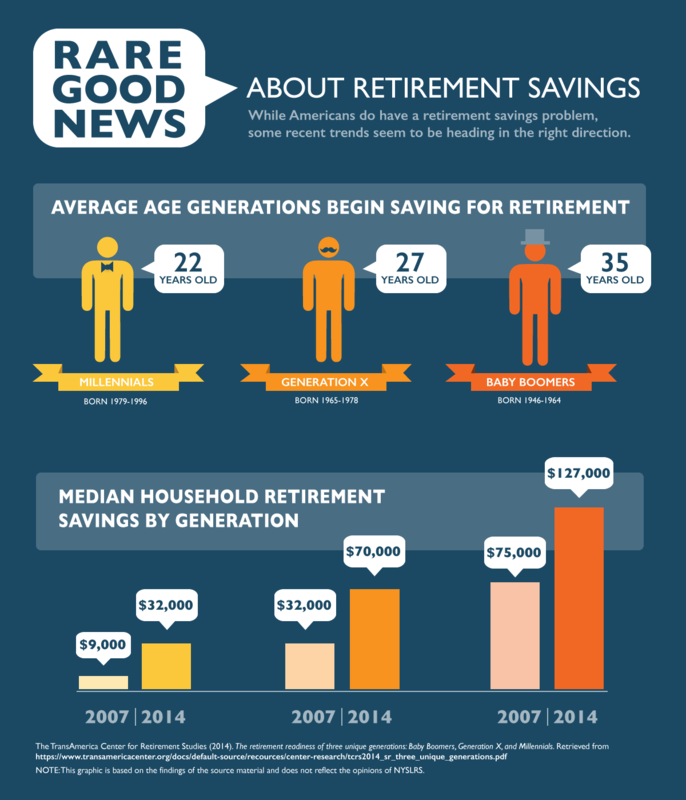 NIRS reported that the typical near-retirement working household only has about $14,500 in retirement savings. Even after counting households’ entire net worth, the report revealed that two-thirds (66 percent) of working families still fell short of conservative retirement savings targets for their age and income, based on working until age 67. 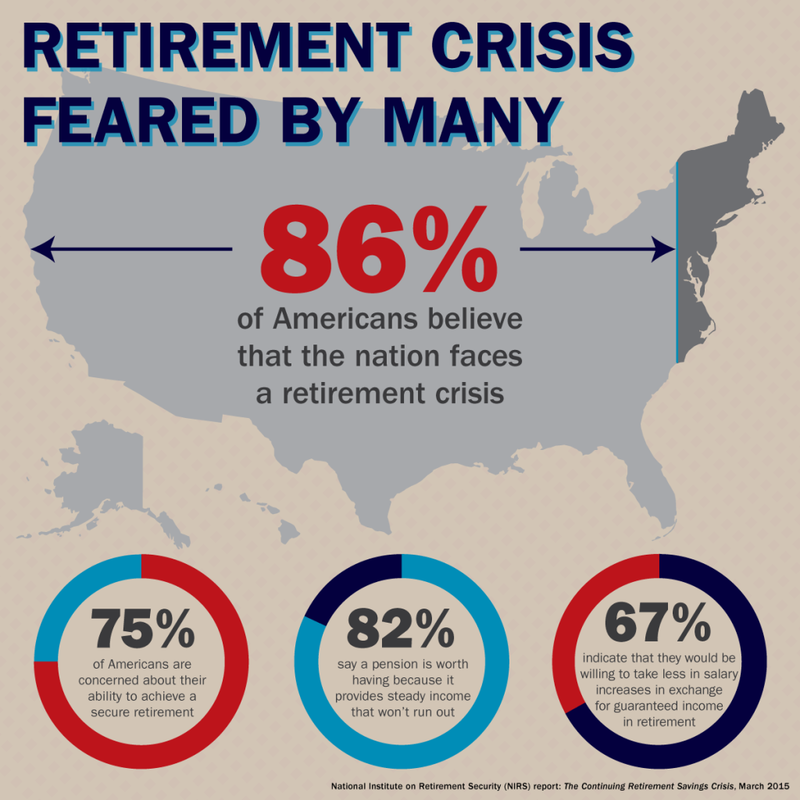 Another NIRS report found that an overwhelming majority of Americans – 86 percent – believe that the nation faces a retirement crisis. 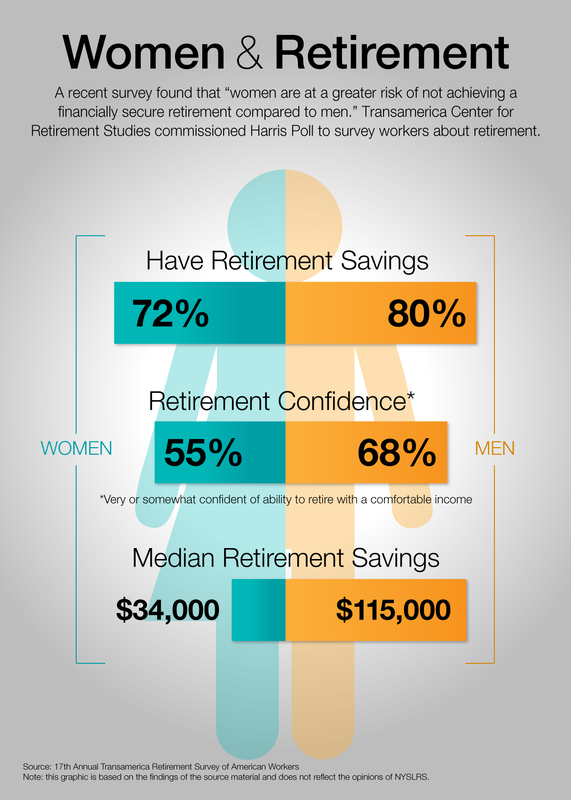 Nearly 75 percent of Americans are concerned about their ability to achieve a secure retirement. Some 82 percent say a pension is worth having because it provides steady income that won’t run out, while 67 percent indicate that they would be willing to take less in salary increases in exchange for guaranteed income in retirement. New York State Comptroller Thomas P. DiNapoli, the administrator of NYSLRS and trustee of the Common Retirement Fund, has long addressed the topic of retirement security and called it “an issue that we have to confront.” In remarks he delivered last June during a Retirement Summit at The New School’s Schwartz Center for Economic Policy, the Comptroller called attention to the “staggering” national retirement savings shortfall that’s between $7 trillion and $14 trillion. Content last revised May 20, 2015. This entry was posted in General News, Members, Retirees, Videos and tagged Comptroller Thomas P. DiNapoli, defined benefit plan, ERS, Information is the Key, members, New York State & Local Retirement System, NIRS, NYSLRS, NYSLRS Retirees, Pension System, personal savings, Personal Savings Plan, PFRS, Preparing to Retire, Retirement Confidence, Retirement Crisis, Retirement Savings, retirement security on May 20, 2015 by NYSLRS.